March 24, 2015 — Downtown Alameda Business Assn. Grab a basket (and the kids) and come out to enjoy the search for prizes and treats in Downtown Alameda! 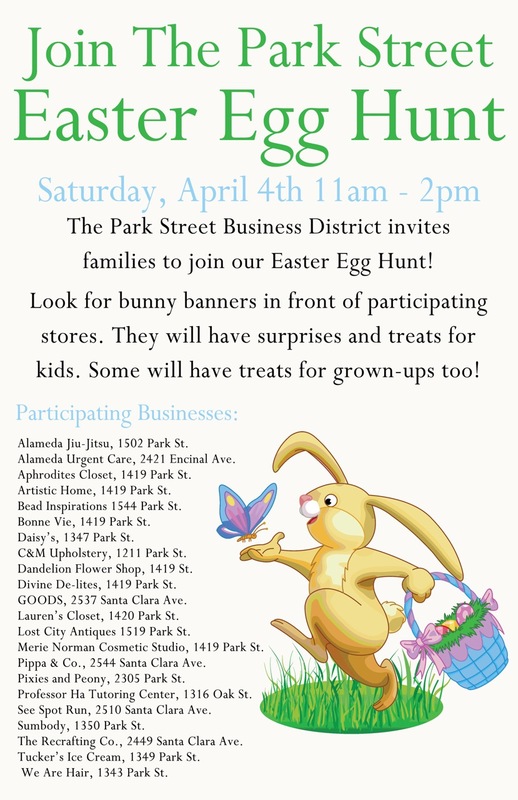 Shops and restaurants in the Historic Park Street Business District invite families to join in on a special Downtown Easter Egg Hunt on Saturday, April 4, 2015 from 11:00am to 2:00pm. All ages are welcome… some businesses will even have special treats for parents. The event is free, but bring your own basket. Start the egg-hunt by searching for colorful “Bunny Banners” posted in the windows of participating businesses. Find a Bunny in the window and that’s your clue there is a special treat waiting inside. With more than 20 local businesses participating, kids will have an opportunity to gather a basketful of treats. A visit with the Easter Bunny will make this family egg-hunt even more special. For a memorable holiday photo opportunity, plan to make a stop at Daisy’s (1347 Park Street) where the kids can meet the Easter Bunny in person. “It’s always a pleasure to work with other merchants on events that bring families to Park Street. It’s especially fun to see the huge smiles as youngsters go door-to-door looking for treats,” says Barbara Mooney, this year’s event organizer. More businesses will be added on the day of the event. So look for the trail of “egg-stra” special signs displayed in the business windows throughout Alameda’s Historic Park Street District and enjoy the search! For more information, visit www.ShopParkStreet.com/news. The Park Street Business District offers great food & drink establishments, charming shops, friendly services, and fun things to do! To learn more about the businesses and events in Downtown Alameda, visit our website: www.ShopParkStreet.com/news. You can also find the “Park Street Business Association” on Facebook, Twitter, and other social sites.